This holiday season, it's easy to get discouraged by overpriced presents, and sometimes, after buying those overpriced presents, the department store you bought it from, charges extra for gift wrapping. And I'm sure you'd do it yourself, if you were any good at it. Well put down the generic wrapping paper, and gift boxes. As I wrap my godchild's Christmas present, I'm going to show you in four easy steps, how to make super cool and attractive wrapping paper out of a brown paper bag. 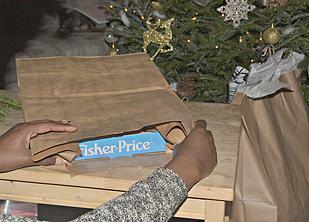 It may seem boring to the untrained eye, but brown paper bags make a cheap alternative to traditional wrapping paper that allows you to add character and pizzazz to your gift wrapping this holiday season. The best part? It's completely recycled and will save you money! Hold edges together with glue dots. I orginally tried to use tape, but it didn't hold. Glue dots are cleaner and easier to use because your hands won't get sticky and it doesn't leave any residue. And you're done! It really is that simple! You can get fanicer and use any kind of ribbon you want, you can write or draw on your brown paper as well. Get creative! And are you stumped for a gift tag? Tomorrow, I will show you how to make a super cute gift tag out of buttons and scrapbooking paper!